Utah Gov. Gary R Herbert and his caravan drive along a flooded road in Weber County, Utah, on Tuesday. Floods are threatening the state after 11.73 inches of rain that fell in March, April and May. That three-month period marked the wettest in Utah history since officials began keeping records in the late 1800s. OGDEN, Utah  Utah Gov. Gary Herbert warned Tuesday that a perfect storm is developing for devastating flooding in northern Utah, but he remained hopeful that emergency responders would work together and with the public to mitigate property damage and prevent any deaths. We can replace the property, but its pretty hard to replace the people, Herbert said after touring areas in Weber County that have suffered about $4 million in flood damage. He asked that parents be extra vigilant with children, who can be attracted to the raging waters that are sure to come. Heavy weekend rains, more mountain snow and rising temperatures have combined to increase flood concerns through much of Utah, although the biggest threats are to the northern part of the state. Weber County Commissioner Kerry Gibson estimated that his county has suffered $20 million in damage already, with the potential for $90 million or more in the next month. Theres no question the Weber Basin drainage is facing the biggest challenge, said Gibson, who watched as the wettest three-month period in state history turned farm fields into lakes. Officials said there have been reports of 10 mudslides statewide, including one about 45 miles north of Salt Lake City that shut down Utah Route 39 for the second time east of Pineview Dam. Workers cleared the road and had it open again by Tuesday afternoon. National Weather Service hydrologist Brian McInerney warned that flooding could get much worse once reservoirs start using emergency spillways and if temperatures stay in the 80s for extended periods. That could happen in northern Utah by mid-June, if not sooner. The hotter the temperatures and more prolonged, the more severe the flooding, McInerney said. 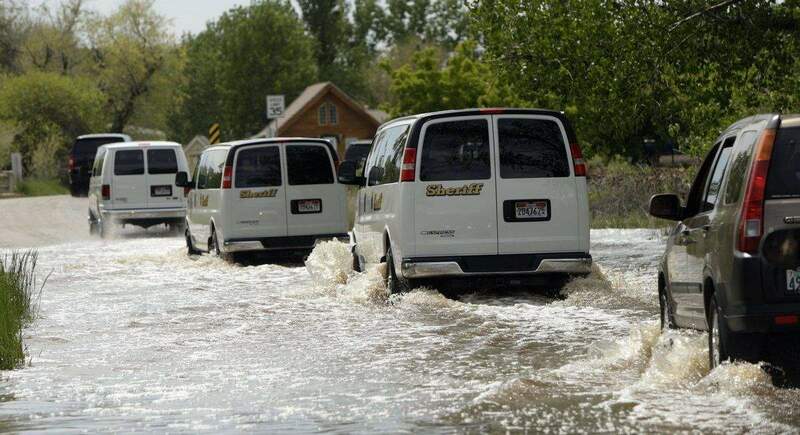 He said the 11.73 inches of rain that fell during this March, April and May marked the wettest three-month period in Utah history since officials began keeping records in the late 1800s. The same three-month period in 1976 brought 10.39 inches of rain, the previous record. When you lose control of the reservoirs, you lose the ability to do flood control, McInerney said. He said areas along the lower Weber River, Logan River, Lost Creek and East Canyon Creek  all in northern Utah  could see significant flooding. Land used for agriculture, as well as two dairy farms, face the biggest flood risks, though populated areas in Logan, Riverdale, Uinta and western Ogden also could get flood damage. If temperatures rise quickly and stay hot for an extended period of time, City Creek and Little Cottonwood Creek in some of the most-populated areas around Salt Lake City also could see significant flooding, McInerney said. Ted Wilson, now an adviser to the governor, was mayor of Salt Lake City during the devastating floods of 1983  a unique year, he said, because there was such a quick warm-up. A cold front Thursday and other cool downs could lessen the flooding this year, but theres about one-third more water still in the mountains compared to this time in 1983, he said. Herbert said authorities have made available 600,000 sandbags, and asked residents to work to prevent damage as best they could to their own property and help others. He said state emergency operations are on a heightened state of alert because of the anticipated flooding, and he indicated the National Guard has been put on alert and will be mobilized if necessary.